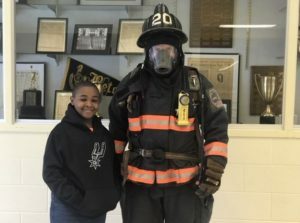 Selma Elementary student Christian Highsmith stands with a Selma firefighter during a Fire Safety event at the school on Oct. 26th. Students at Selma Elementary School welcomed members of the Selma Fire Department on campus last Friday. Firefighters gave three assembly presentations on fire prevention and safety. All elementary students attended the assemblies where firefighters discussed fire safety tips, evacuation plans, and checking smoke detectors. Students were engaged in the presentations and were wowed by the opportunity to watch the firefighters dress in their professional gear, as they learned the importance of each piece of their turnout gear and equipment. The students asked firefighters about rescuing families and individuals from burning buildings and were encouraged to spread the information they learned about fire safety with their families and friends.